ANGELS ARE ALL AROUND YOU RIGHT NOW! Angels are all around you right now! Yes! Right Now!! Yes, they are everywhere you go…east, west, north or south. As I speak to you, they are looking at you right now. They know you have just picked this book to read and do not wish for you to drop it. Why? It’s simply because they are excited that you will finally be properly and adequately enlightened about them and their godly activities all around you, plus how to easily and intentionally activate them and their assistance. Angels….Yes Angels! Spirit Beings Assigned To Minister To You. 1. They gives understanding to your visions and/dreams. Daniel 8:15-19; 9:21-23. They do so because they have knowledge. Revelation 17:7. 2. They reveal God's will or announcing key upcoming events in your life. a. For example, they can show you (as a married woman) that a baby is coming (pregnancy). I, for example, always gets revelations about all my children before they are born. Genesis 19:1-22; Exodus 3:2-6; Judges 2:1-5; 13:2-23; Acts 10:5; Revelation 1:1. 3. They warn men and women. They warn you. Revelation 14:6-19. They can show you the dangers or challenges ahead in a journey, project, investment, mission or relationship you are about to embark on, or the one you are already in. 4. They comfort and encouragement and strengthen. Acts 27:24-25. 5. They protect, ensuring the well-being or survival of God's people. Genesis 19:1-25; 48:16; Exodus 14:19,20; 1 Kings 19:1-8; 2 Kings 6:16; 2 Kings 19:35; Psalms 34:7; Matthew 4:11; Acts 5:17-23; Acts 12:7-11; Exodus 23:20-23: 33:2; Psalms 91:11. 6. They carry out punishment, enforcing the wrath of God on the wicked. Genesis 19:12-13; Exodus 12:23,29; Exodus 32:34: Numbers 22:22; 2 Samuel 24:17; 2 Kings 19:35; 1 Chronicles 21:15; 2 Chronicles 32:21: Psalms 78:48-5; Isaiah 37:36; Acts 12:21. 7. They chase our adversaries, providing vengeance to God’s glory. Psalms 35:4-6; Romans 12:19. 8. They monitoring our words and our vows, and checks on what we say we will do. Ecclesiastes 5:4-6. 9. They carry out medical and healing assignments and services when necessary. John 5:2-4. Note that they are not the healer…, but just messengers of the healing already work of Jesus Christ and His Holy Spirit. 13. They Watch men’s lifestyle. 1 Corinthians 4:8-9. BIBLE FACTS ABOUT ANGELS ALL AROUND YOU. 2. They were all created by God. Gen. 2:1; Neh. 9:6; Eph. 3:9; Col 1:16. 3. They are not to be worshipped. Col. 2:18; Rev. 19:10. 4. They report directly to God. Job 1:6; 2:1. 5. They were created to live forever. Luke 20:36. 6. They are spirit beings. Ps. 104:4; Heb. 1:7, 14. 7. They are normally invisible to the human eyes. Rom. 1:18-32; Col. 2:18; Rev. 19:10; 22:9. 8. They are innumerable. Deut. 33:2; Matt. 26; Heb. 12:22. 9. They possess superhuman intelligence and power. Mark 13:32; Ps. 103:20; Dan. 9:21-22; 10:14; Rev. 19:10; 22:8-9. 10. They appear to man in human form. Gen. 18:2; 19:1, 10; Acts 1:10. 11. They possess will. Isa. 14:12-15; Jude 6. 12. Imperfection is ascribed to them as creatures. John 4:18; 1 Pet. 1:12. 13.They display joy. Job 38:7; Luke 2:13. 16.They are stronger than men. Ps. 103:20; 2 Thess 1:7; 2 Peter 2:11. 17.They are of different orders. Isa. 6:2; 1 Th. 4:16; 1 Pet. 3:22; Jude 9; Rev. 12:7. 18.They are more intelligent than men. Dan. 9:21-22; 10:14. 19.They are elect. 1 Tim. 5:21. 20.They rebuke idolatry. Judg. 2:1-4. 21.Some angels harm human beings. Mark 5:1-5.13. 22.They are very careful and are not rash, and are examples of meekness. 2 Pet. 2:11; Jude 9. 23.They are not omnipresent. Dan. 10:12. 24.They are not omnipotent. Dan. 10:13. 25.They are not omniscient. Matt. 24:36. The Word “angel” in Greek is the word ‘angelos’ and in Hebrew is the word ‘malak’. The term "angel" means "messenger." Genesis 22:11-12 Abraham told not to kill Isaac. Judges 13:13-14 Manoah and his wife told of son to be born. Luke 1:8-19 Zacharias told about his son by Gabriel. Luke 1:26-38 Mary was given an angelic message. Matthew 1:18-24 Joseph had a message from an angel about Jesus. Luke 2:8-12 Shepherds all have message by angels about Jesus. Acts 8:26 Philip told to go to the desert. Acts 27:23-24 Told Paul that they would be delivered from the storm at sea. HOW TO PUT YOUR ANGELS TO WORK. Most people find it easier to visualize angels in the heavenlies than to accept the fact that they also visit us and assist us on earth. Angels of God are there for you to use in battle against the forces of evil. 2. Build up your confidence in God. 4. Command them to action. 5. Invoke their arrival by calling upon the Name of JESUS. 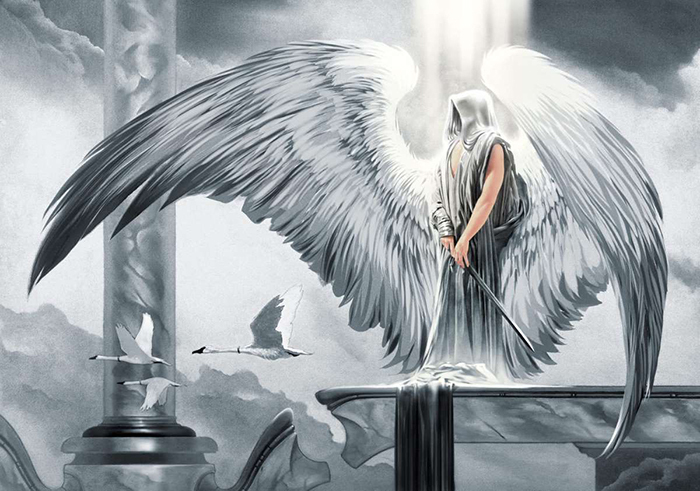 I see the angels of God appear to draw their sword against your enemies. 44 Strong Thoughts On Leadership Influence. WHY GOD USES ORDINARY PEOPLE..! 9 THINGS YOUR PRAYERS CAN DO FOR YOU NOW! 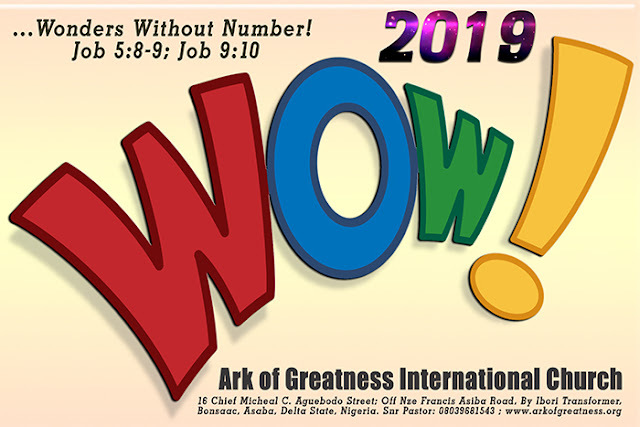 2019 WOW! Our Year of WONDERS WITHOUT NUMBER! SEVEN UNIQUE WONDERS OF THE WORD OF GOD. 40 IMPORTANT BIBLE VERSES YOU NEED FOR 2019.